Fishing With Flies :: Blog: Switching to simple flies: The "One Feather Fly"
Over the years I have switched more and more to simple flies. It gives me a thrill to catch fish on a fly that is made with just one or a few simple and easy-to-find materials. To be sure, if I felt that such flies compromised my fishing success I would not use them. But I am convinced that most of the time the fly chosen makes very little difference. As long as it is presented effectively (eg. action, depth, speed) by the flyfisher, I believe that most of the time the fly chosen is perhaps only 10% of the success equation. I say "most of the time"; there are of course times when the fish are very selective and fly selection is correspondingly more important. Such selectivity is experienced when "fishing the hatch". But most of the time I would say that the fisherman's skill is 80% of the formula, the equipment is 10% and the fly is the final 10%. The fly is just part of the "tool kit". It is up to the fisherman to know how to present the fly and "work it". This is why over the years I have worked to reduce the number of flies I carry (though I always have a few "experimentals" along). Instead I am concentrating on a smaller selection of flies. By doing this I have become more confident in the flies I am fishing. A couple of the the subsurface flies I have concentrated on in recent years are the Conehead Combo (clickable for recipe and pictures) which I now carry only in olive and only in two sizes, and the Hare and Herl Bugger (clickable for recipe and pictures) which I carry weighted with 10 wraps of lead and in only one hook size. There are two other simple subsurface flies that I have enjoyed fishing that I have not yet reported on. The first one is tied with just one feather. The second pattern requires two feathers. I plan to follow up this post first with step-by-step instructions and photos for the "One Feather Fly". But until I do, pictured below are the simple materials required: 5/32" beadhead, sizes 8 Tiemco 1xl hook, and one rump feather from a ring neck pheasant. If you had to tie a fly with only these materials, what would it look like? looks like a fun concept! Nicely written stuff and good looking flies, Peter. Having grown up fishing in Mass. it was cool to stumble upon your site. Frank Woolner would be proud of you. Olive thread. Wrap from the head to the hook bend. Tie in a length of olive hot wire for rib and wrap thread about two-thirds of the way back toward the head. Tie in the feather by the stem, palmer to the head and finish with a proportional head (bead optional). Now, pull most of the palmered hackle back and hold it at the hook bend while winding the ribbing wire forward over it, give the wire a few turns behind the 'hackle', snap it off (with hackle pulled forward out of the way) throw a few turns of thread over the end of the wire and whip finish it. 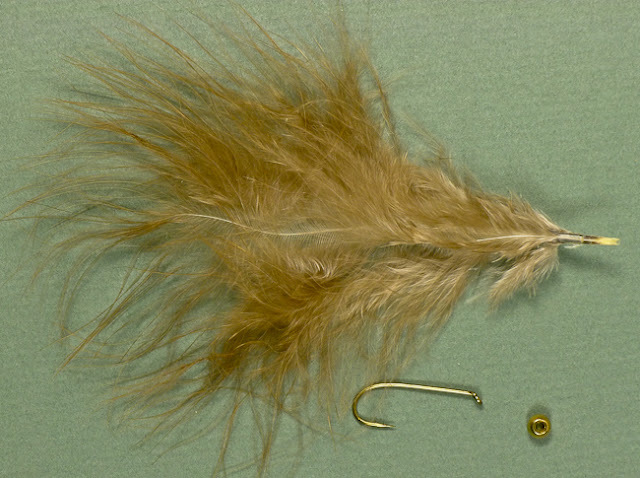 Train the hackle back into place and you have it. Make a good leech pattern, same way. Pheasant body feathers are good for this. Steve, Sounds like a wonderful and easy fly. Any chance you could send me a sample so I could photograph it closeup and add to my Web site under "Flies With a Story"? It would be a nice addition! BTW, my brother lives in Spokane and spends most of his time hunting, fishing, and shooting. Are you at all near there? Peter, I live upriver (Columbia) from Northport WA, about 100 miles north of Spokane. Your brother probably knows the country. Be glad to send you a sample of the fly, email me with an address: columbiatrout@sbcglobal.net and I'll get one off to you. Okay. Great. I will email you offline. BTW, I just went to your excellent blog, and added it to my feeds. For everyone else, just click on Steve's name at the beginning of his posts (should be bold, in red/maroon) and click on it, to get to his blog.